Allah, Praise and Glory be to Him, negates that He is unjust, He says in the Qur’an, “..and none shall be dealt with unjustly”(BAQARA, 281), “..but God never wishes injustice to His Servants” (GHAFIR, 31),“..nor is thy Lord ever unjust in the least to His Servants” (FUSSILAT, 46). On Doomsday Allah, Glory be to Him, says, “..no injustice will there be that Day” (GHAFIR, 17), “..so that not a soul will be dealtwith unjustly in the least” (ANBIYA’, 47),“..We did them no wrong, but they were used to doing wrong to themselves”(NAHL, 118), “..it is not God that haswronged them but they wrong themselves” (AL-I-‘IMRAN,117), “..and not one will thy Lord treat with injustice” (KAHF, 49). Thereupon, nothing remains but favour and justice, and (the Just) is one of the Names and Attributes of Allah; His favours are abundant, He favoured creatures by giving them existence; creation was not HisDuty, and He does not benefit from obedience. Glory be to Him, Who can never be harmed by sins, neither would he be benefited from anyone’s righteous deeds, because faith and unbelief, obedience and disobedience can neither benefit nor affect His Supreme Self; to Him Might and Glory are attributed since eternity even before He created the universe. It is up to Allah to impose on His creatures what He wishes and not what they wish, and to request from them what they cannot afford. If He admits them to paradise then this is because of His Mercy and not because they deserve it; and if He admits them to hell, then this accords with His Justice. He cannot be questioned for His Acts and they will be questioned for theirs. One of the manifestations of Allah’s Mercy is that He imposed on people that they should know and obey Him according to legislationand conveyance and not according to their mental faculties; that is whyHe sent His Apostles and supported them with miracles that denoted theirtruthfulness, He sent the holy books with the most accurate verses thereinto reveal the straight path to the human beings and show them the way oftheir salvation. 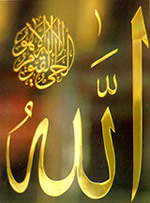 Then Allah’s Mercy overwhelmed the worlds and He sent the Seal of the Prophets and bestowed upon Him the Grand Qur’an which invalidated all the previous religions and heavenly regulations, and He is satisfied only with the faith of Islam; the testimony (There is no god but Allah) became insufficient unless it is annexed to the testimony (Muhammad,Allah’s Prayers and Peace be upon him, is the messengerof Allah). As mentioned in the Qur’an and as the Prophet himself said, the Prophet’s delegation has been realized to mankind as well as to the Jinn, and Allah supported him with a myriad of miracles the grandest of which is the Qur’an with which He challenged the most eloquent of the Arabsthat they can not produce anything like it and challenged the scholars of the Jews and the Christians with the stories of the prophets and the peoples who preceded him. Prophet Muhammad, Allah’s Prayers and Peace be upon him, an illiterate Arab who grew up among pagans and remained with his people before the revelation for forty years, and his peopleused to call him (Muhammad the honest) for his renowned integrity. Allahhad ordained that everyone who heard of Islam must believe in every single detail that the Prophet mentioned about this world and the hereafter.